I have had a beautiful big bunch of watercress sitting in my fringe for the last couple of days. Whilst contemplating what to do with it I also picked up a big bulb of fennel, its the perfect time of year for these two contrasting vegetables. The watercress was just too fresh and lovely to be turned into a soup so I thought a salad would be perfect. Pairing the bitter watercress with sweet fennel and carrots turned out better than expected and the fresh orange dressing is pretty amazing! It’s like autumn on a plate! Also, sorry about my lack of posts lately I have been bombarded with uni work but only a few weeks left then I’ll have all the time in the world to play in the kitchen! Preheat the oven to 200 degrees celsius. Thinly slice the fennel and place in a bowl. Quarter the carrots and add to the bowl along with the olive oil, honey, thyme, salt and pepper. Give it a good toss then place on a lined baking tray in the oven. 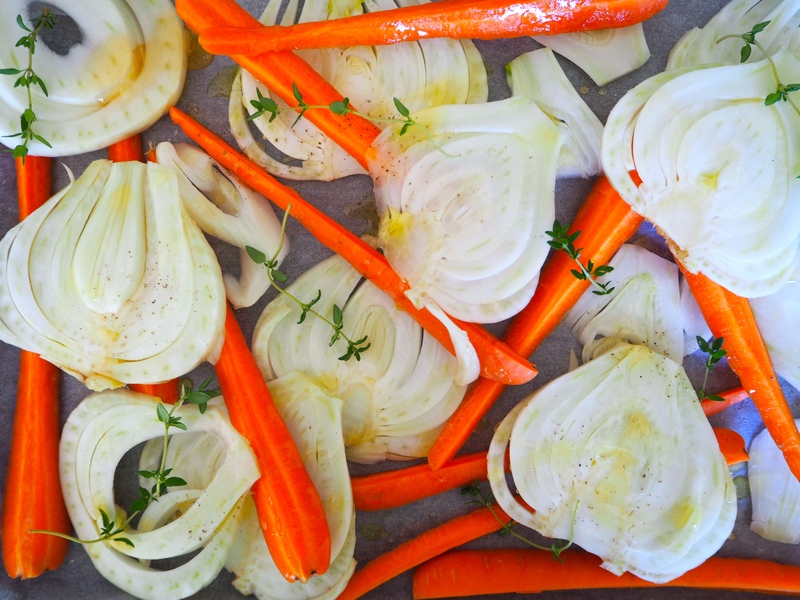 Cook for 30 – 40 minutes or until the carrots are tender and the fennel is starting to caramelise. Meanwhile, wash the watercress and discard any thick stalks. Place on your serving dish. To make the dressing place all the ingredients in a jar and shake it up. Season with salt and pepper. 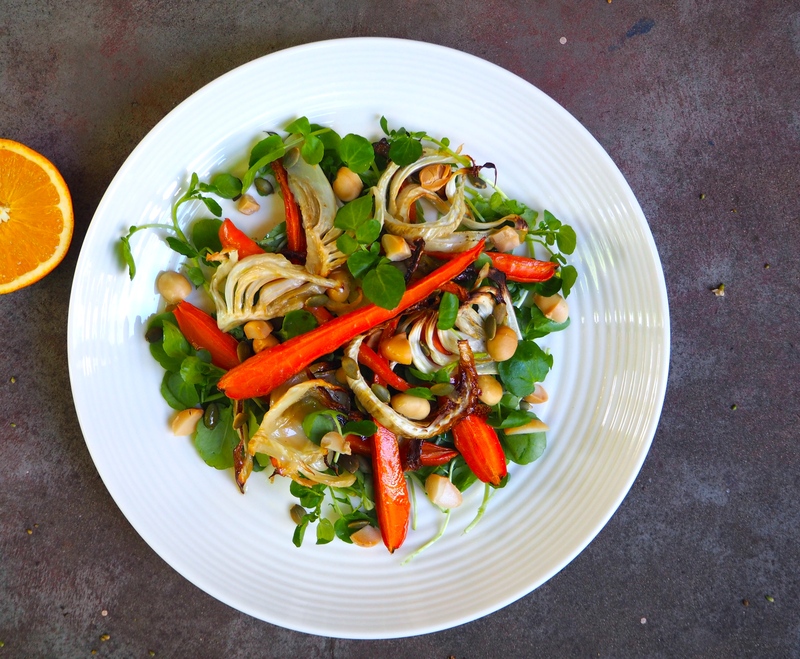 When the carrots and fennel have 5 minutes left in the oven add the pepitas and macadamia nuts. Cook until golden brown. 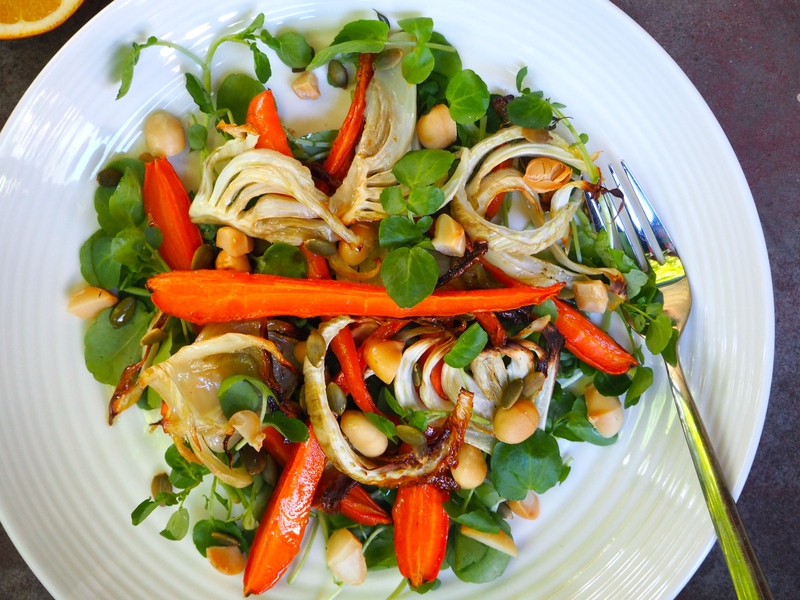 Rest the carrots and fennel for a few minutes before assembling the salad. Just before you serve pour the dressing over.